When fielded, reroll all other non-Apocalypse characters. Your opponent takes 2 damage for each of his or her dice that rolled energy. Any dice removed from the field as a result of Apocalypse's fielding ability are not considered to have been knocked out. Apocalypse: Earth-295's ability text refers to only a single ability, not two distinct abilities despite the sentences being separated by a space. If this wasn't the case, the second sentence would use, "While Apocalypse is active..." text. ^ When Fielded Question . Wizkids Rules Forum. Retrieved 7-14-2015. ^ Apocalypse – Earth-295. Wizkids Rules Forum. Retrieved 8-6-2015. 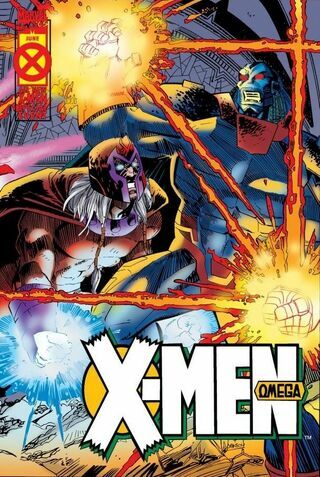 ^ X-Men Omega Vol 1 1. Marvel Wikia Database. Retrieved 1 August 2015.